Get the freedom and flexibility to provision infrastructure and applications in minutes rather than months. If you are like most companies, you have been adding servers, storage, and networking devices to keep pace with your business demands. You could be spending upwards of 70 percent of your IT budget on operations and maintenance, which means you are spending 30 percent or less on innovation that is critical to growing your business. You don't have to be captive to unmanageable IT sprawl. Solutions are available today to help you realign traditional technology silos into virtual pools shared by any application and flexible enough to change as business needs evolve. HP CloudSystem Matrix offers a self-service infrastructure portal for auto-provisioning and built-in lifecycle management to optimize infrastructure, monitor applications, and increase uptime for your cloud and traditional IT. 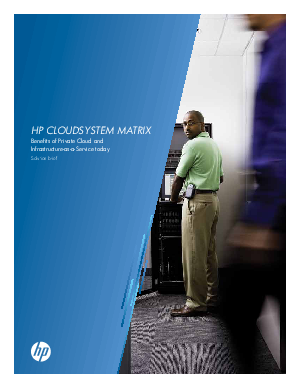 This solution brief will help you understand the benefits of the HP CloudSystem Matrix which provides a unified solution for physical and virtual environments that's perfectly suited as an IT consolidation platform.